Fruit flies can be a problem almost anytime of the year, especially if you are buying fruit from a farmers market or other open air kind of market! These little pests lay their eggs on your fruit and those eggs are brought unknowingly into your house (gross, right? ), hatch and fly around looking for fruit to snack on. Basically they exist to do two things: eat fruit and lay eggs, and they reproduce like rabbits! Here is a super easy homemade fruit fly catcher you can easily make with items you most likely already have around your house! Cut off one of the corners of the plastic bag to create a small hole. Fill the bottom of your glass with the apple cider vinegar. Spread the plastic bag over your glass and push down into the glass so it makes a funnel shape, with the hole in the middle, but making sure it doesn’t touch the vinegar. Wrap the rubber band around the glass and bag so the flies can’t get out through the sides! And thats it! The flies are attracted by the fermenting apple scent of the vinegar and fly into the hole and into the glass. They cannot figure out how to get back up out of the glass and are trapped in the vinegar. If you’re wondering if this really works, the proof is in the vinegar! Have you ever made a similar fly catcher? Let me know if you try this one out! 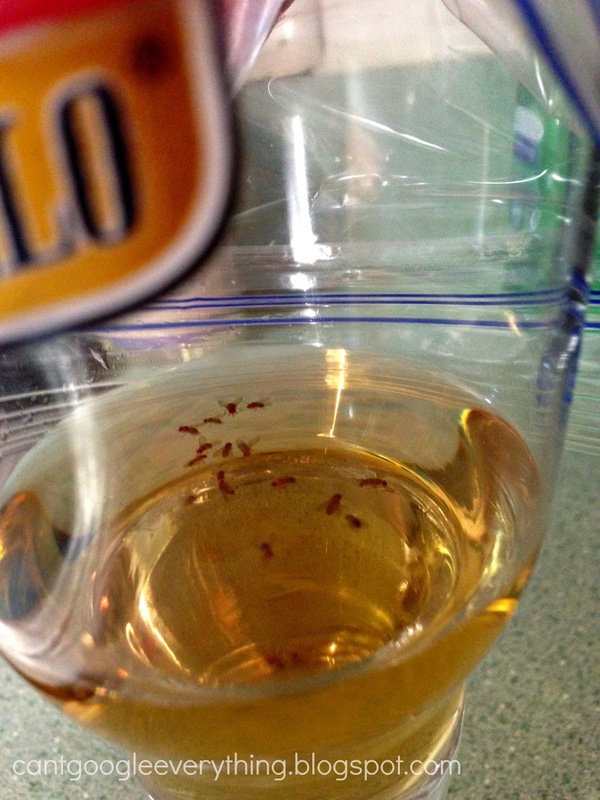 Ugh these fruit flies! Trying this for sure! Yeach! I believed you without the proof haha. We had a major fruit fly pest this year, and got rid of it with a similar trap: 1 part water, 2 parts apple cider vinegar, and 3 parts fruit juice mixed in a bowl with a few drops of dish soap (it eliminates the surface tension of the liquids, so they fall in and drown). Works so, so well!! I have not but what I have done is.. when we are outside eating after grilling..after eating corn on the cob I will place a cob on a paper plate and that will keep the flies away from us..